Get your kids into the Star Wars spirit this Halloween with one of our child Chewbacca costumes. We carry a wide selection of kids Chewbacca costumes that will make your child the talk of the town. 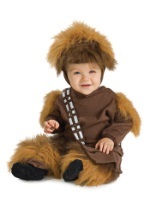 We even have a Chewbacca toddler costume that comes in newborn and infant sizes!